Our attentive team will ensure you have a successful stay in one of our 53 modern and welcoming rooms. Enjoy the menu at our Léon de Bruxelles on-site restaurant or in your room. In the heart of the city center, on the banks of the Moselle River opposite the City Hall, the Mercure Thionville hotel offers an optimal location for both business and leisure trips. Just 5 minutes from the TGV train station and 30 minutes from Metz and Luxembourg, this lovely hotel is perfect for a weekend getaway. We have 53 rooms with air conditioning and free WIFI. Nearby public car parks. 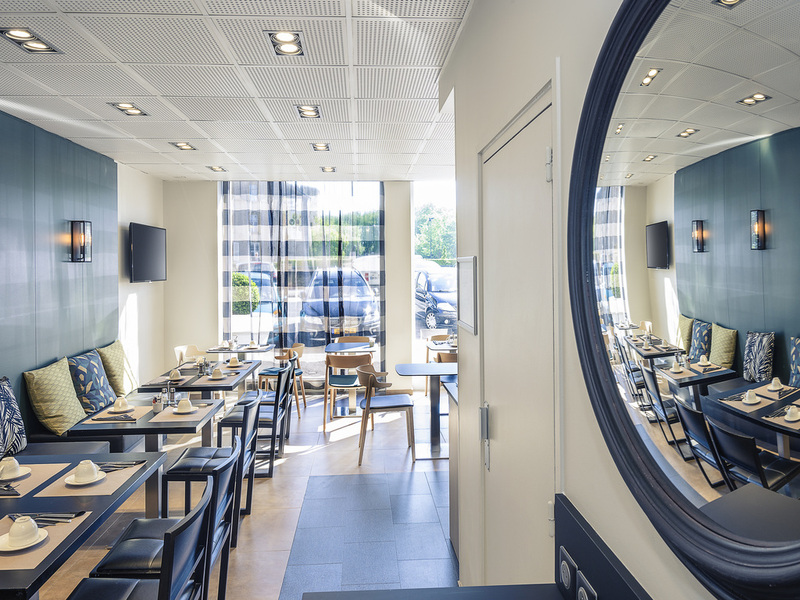 With family, friends or business Mercure Thionville is ideally located. The Cattenom nuclear power station is only 15 minutes from the hotel. At the crossroads of Europe between Belgium, Luxembourg and Germany benefit from privileged location of the hotel. At 30 minutes from the International Airport of Luxembourg and close to the A31 motorway linking Metz in Luxembourg. The hotel is the ideal base for touring the memory of Lorraine and its surroundings. At the heart of Europe, in the capital of the 3 Borders region, the Mercure Thionville hotel is handily situated for excursions or business travel to Germany, Luxembourg or Belgium. Whether you opt for a Standard Room, one of our two recently renovated Privilege Rooms or our panoramic Suite, the Mercure Thionville Centre gives you the comfort and quality of services you have come to expect. WIFI was not available in my room, The room is reasonable and clean but stuffy without fress air. The hallways are musty and stuffy. Breakfast is limited and not worth the 15€. There is no open space where one could meet and chat with friends or business associates. Very poor standard hotel.No parking.Hotel reception manned by a unresponsive, unsmiling man. Rooms were very dated and dark. This was more Ibis standard than Mercure . Paid €85 per night. Won't be back . Merci d'avoir choisi de séjourner chez nous, merci de votre avis concernant la suite, A bientôt pour un prochain séjour ! The air-conditioning wasn't working on the day we stayed, so we had to change rooms as it was impossible to sleep in the original room with the windows open due to traffic noise. The new room, on the top floor, was quieter but only had a small window near the celling, so not ideal. Very helpful reception who gave us a room with a bath as we requested. Super view of the town and the Moselle. Lovely town, good value hotel. I can recommend your hotel to anyone wanting to stay very close to the best restaurants in Thionville and only steps away from the very lovely city centre. The breakfast needs quality improvement, better equipment to keep food and fresh fruit refrigerated for late comers. My room was great, fantastic walk in shower, but did miss some amenities like mini shampoo, conditioner and body creme. Excellent safe in the room and a brilliant air conditioning system that I could easily manage to suit my needs. Wi-Fi also perfect. Excellent service, an excellent room, staff could not have been more helpful and the location close to the town centre was excellent. Although the hotel has no parking on the premises the nearby public parking overnight was again not a problem. The atmosphere in the town was welcoming and the food excellent. If we travel this way again we will use this hotel. Nice welcome. Room well maintained. Big space. Hotel is in need of refurbishment. Whilst my room was fine my friend had to move room three times due to leaking air conditioning units and the bathroom in my room smelt musty. Whilst the staff on reception tried to help it was clearly difficult for them to find rooms for my friend to move to. To be fair the Privilege rooms are large airy rooms and comfortable. room too small and noisy due to the street in front of it. Nice service at the reception. Noisy and luck of vegan choices for breakfast. As I've written above. Noise from the street from early morning and luck of vegan choices for breakfast.